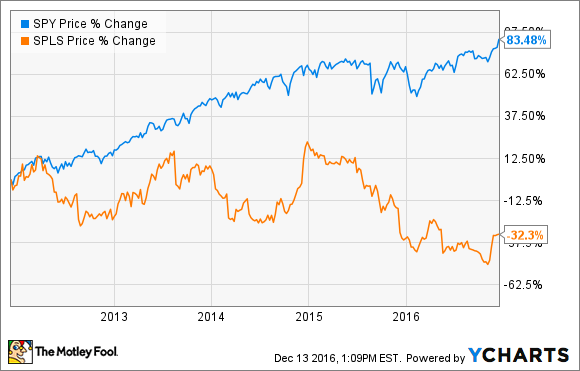 These three companies are cheap and offer big dividend yields, but are they worth buying? This article was updated Dec. 13, 2016, and originally published July 30, 2016. Interest rates are at historical lows all around the world, which is enticing investors to put money to work in the stock market if they want to generate income. Unfortunately, the yield on the S&P 500 is only about 2% right now, and its trailing price-to-earnings ratio of 26 suggests that the market is expensive. For that reason, some investors are searching for top stocks to buy that are cheap and offer up a higher dividend yield than the market in general. Below is a closer look at three companies -- Ford (NYSE:F), Staples (NASDAQ:SPLS), and AT&T (NYSE:T) -- that fit that description perfectly. You might be surprised to learn that Ford has morphed into a cheap income stock over the past few years. After all, the company was forced to abandon its divided in 2006 so it could hoard capital and survive the Great Recession. However, Ford returned to its dividend-paying ways in 2012, and its payout has grown at impressive rates ever since. With Ford's stock now trading for less than seven times earnings, the company's yield has been pushed up to more than 4.6%. So why are the markets valuing Ford's stock so cheaply? It's likely because investors are concerned that the North American automotive market is peaking. Since auto sales are highly cyclical, it's possible that the company's profit margins are simply unsustainable. If this premise is true, Ford's bottom line could stall over the next few years. There are plenty of reasons to believe that logic holds water. After all, gas prices are quite cheap, so sales of Ford's high-margin trucks and SUVs are going strong. However, if oil prices rise, consumers might once again start to favor more fuel-efficient cars, which could put a damper on Ford's profitability. In the longer term, the company is also facing the very real risk that autonomous vehicles and ride-sharing could cause total car sales to stagnate or decline. Add to those worries the recent news that Tesla Motors is working on a pickup truck, which may threaten what has been Ford's bread-and-butter product lineup for decades. With all of that going on, it's not hard to understand why the markets are cautious about this company's long-term future. However, I think the odds are good that Ford will be able to crank out strong profits, so if you're looking for a stock with a cheap valuation and juicy yield, Ford isn't a bad choice. E-commerce giant Amazon has been wreaking havoc on the retail industry for the last two decades, and office suppliers like Staples have been hit particularly hard. That's a big reason shares of this once-promising company have drastically underperformed the market over the past five years. Staples shares have been crushed so badly that they are now trading around 11 times next year's earnings, and the stock's dividend yield has ballooned to 4.8%. That's a ridiculously cheap price and a huge yield, but I would suggest that investors avoid buying at this time. Why? I'm worried that Staples stock could be a value trap. Take a look at last year's results to see what I mean. The company is closing underperforming stores rapidly, and yet those that are still standing aren't exactly doing great. Companywide same-store sales dropped 4% in 2015, and that's even after you include sales from Staples.com. Looking ahead, I have a hard time seeing how the company will pull out of this tailspin. After all, the pressure from e-commerce is only growing, which will put further pressure on Staples' weaker stores. That will likely lead to even more store closures, spreading fixed costs over fewer locations, weakening the company's future. That's a negative feedback loop that I see no end to. Analysts concur with that grim view of the future, which is why they are projecting that earnings are going to shrink by 1% annually over the next five years. I think that's being generous since the company's growth rate over the past five years was negative 12%! Staples stock is most certainly cheap, but I'd argue that's for a good reason. The enormous growth in smartphone sales has greatly benefited telecom companies like AT&T (NYSE:T) over the last few years. 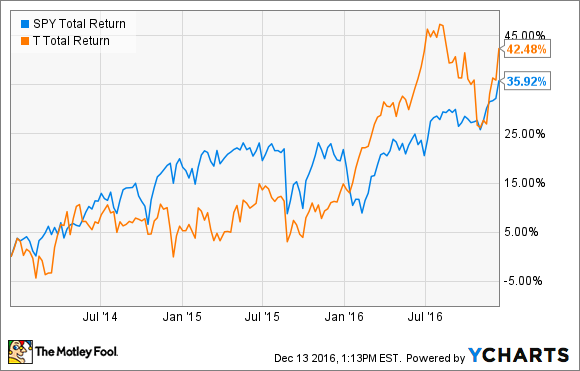 On a total-return basis -- which accounts for dividend reinvestment -- shares of AT&T have outperformed the market over the last three years. So with shares trading for less than 14 times next year's earnings and offering up a dividend yield of 4.8%, is AT&T a ridiculously cheap stock hiding in plain sight? It's possible that the company is a bargain right now, but there are a few kinks in the company's circumstances that give me pause. For one, AT&T's smaller competitors T-Mobile and Sprint have expanded their coverage over the past few years. If consumers start to feel that mobile service has truly become undifferentiated, then they may start to shy away from AT&T's higher-priced offerings in favor of cheaper alternatives. There's also the fact that customers are increasingly choosing to go without cable, which could spell long-term trouble for both its traditional wired cable business and its DIRECTV division. So far the subscriber gains from DIRECTV have been more than offsetting the losses from its AT&T U-verse product, but this is a trend that could reverse course. For the time being, AT&T looks like it's in a good position to keep up its modest growth. Industry watchers believe that the company will grow its bottom line by more than 4% annually for the next five years. That's not exactly eye-popping growth, but it's a decent enough number for a juggernaut like AT&T. For investors who want a massive dividend yield and a cheap stock, this company might not be a bad choice.